Boozy Saturday was winding down, and for our final round we decided to correct some coffee. James had some Stumptown Gajah Aceh beans that were pushing the end of their useful lifetime, and we really wanted to try correcting some coffee with Fernet Branca. 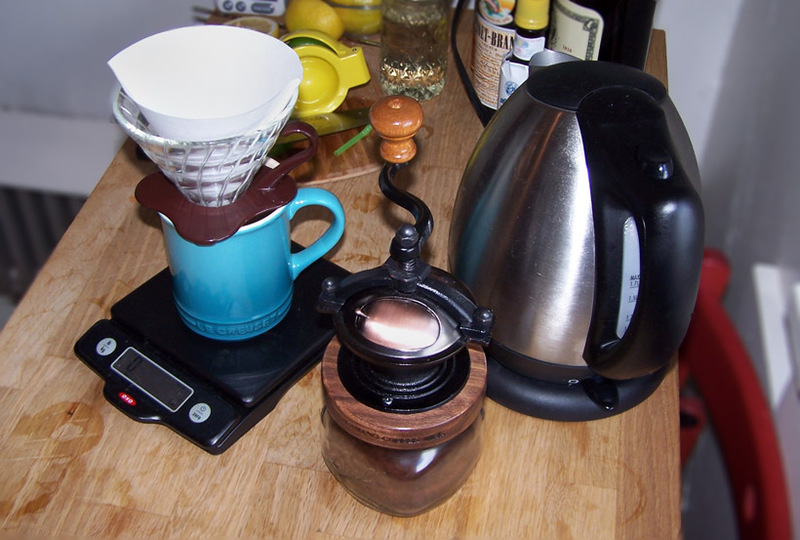 I don’t have any advice about brewing coffee, but James’ steampunk grinder looks really cool, so here is a picture of it. We tried a few different concepts, but none of them were surprisingly excellent. Fernet and coffee on its own is just missing something. The bitterness from fernet is very different from the bitterness in coffee, but the interplay is not intriguing; both flavors are merely present. Rye and fernet is delicious, and rye and coffee is very reasonable also, but rye and fernet and coffee somehow blended to create the flavor of a rotting vegetable. I apologize for the unappealing description, but it was truly awful, and I want to make sure that you don’t try to make a drink like this. A quarter ounce of simple syrup took away the worst of it, but it was still not a drink I would serve to anyone whose friendship I valued. Still chasing the tropical flavor from earlier in the day, I added rum and maraschino, and came away with something much more drinkable, but I still wouldn’t endorse it highly. Add spirits to hot coffee and stir. 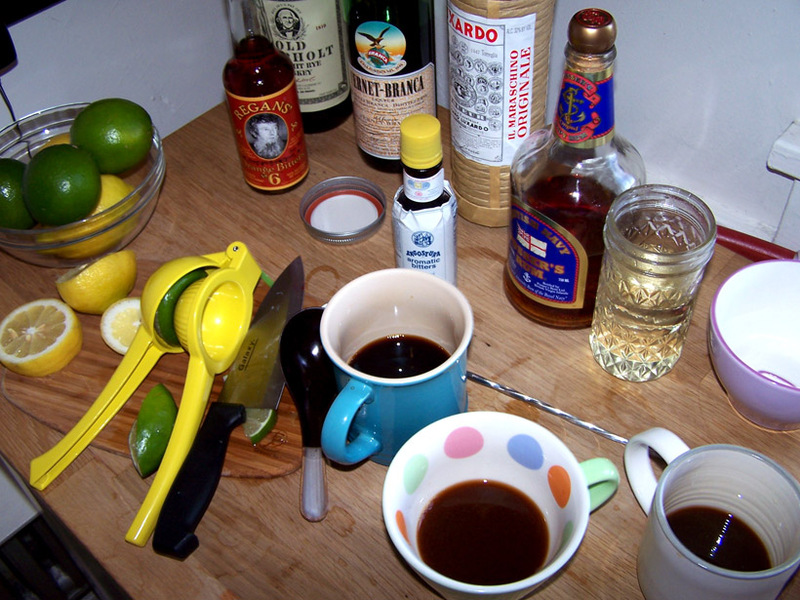 It’s probable that there is some perfect marriage of coffee and rum out there, but it probably has Benedictine or allspice dram, not maraschino. Maybe it doesn’t contain a liqueur at all, but a bit of simple syrup. A tragic truth: the world is full of coffees and and rums, and you’ll never be able to try all of them with all of them. And of course, our old pal, orgeat, was still hanging around, so we tried once more, and this was the best of the three, but still not quite where I wanted. The almond latte is a very common drink, so adding rum to coffee was a very natural extension. I think the concept with this variation is sound, but the specific rum and coffee that we used were ill-suited to each other. A grate of lime zest might be a welcome addition, also. Fortunately, we can brew more coffee. Categories: original creations, spirituality | Tags: booze, chemex, cocktails, coffee, drinking, drinks, drip coffee, fernet, fernet branca, luxardo, maraschino, mixed drinks, mixology, orgeat, orgeat syrup, pusser's, rum, rye, stumptown roasters | Permalink.